As you know, Mr. Coffee and other cheap plastic drip coffee makers pour boiling hot water over toxic BPA plastic. This is avoidable with an all glass, BPA free, pour over drip coffee maker. Specifically, the Chemex. Other options include a simple glass or stainless steel french press or the all stainless steel percolator, both nontoxic and containing no plastic. But you must be careful because other “stainless steel” coffee makers often include aluminum and metal coated brewers. This should also be avoided. Glass is the only true way to get your fresh nontoxic BPA free organic coffee. ChemEx all glass pour over coffee. Percolator stainless steel coffee pot. When it comes to pure organic coffee, there really is only one choice, glass. Even toxic plastic products claiming to be BPA free are made of BPS, a slight deviation of BPA. One molecule changed and a rename to label products as BPA free. Do not trust this label. In years it will be under the magnifying glass. Even stainless steel from China is often questioned. I have listed the one manufacture that claims to be 100% stainless steel. Many of them have aluminum coated insides. Yet another reason to trust in glass. 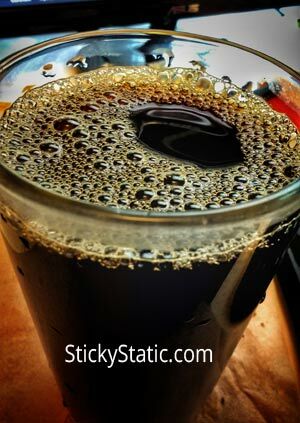 My thoughts on organic brewed coffee? What is the point of going BPA free if you’re not going to use fresh organic whole coffee beans? You can get all fancy, but if you’re still putting Folgers in your cup, you’re doing it wrong. These are great organic fair trade whole bean coffee suppliers that you can buy direct online. I personally have the top 2 at the same time so I can switch it up. I lied about the 3rd one. I have not ever tried it because I do not do Pumpkin Spice but a lot of people swear by this one. Try it and comment below. Sure, instead of just pressing a button on your plastic automatic coffee machine, you must now spend 3 minutes pouring hot water over your coffee beans to brew it. But the fresh chemical and BPA free drip coffee is going to be so worth it. I do this every morning and it really does not take as long as you think it would. You even find other kitchen task to complete during the process. If you want clean coffee, this really is your only option. Do not be fooled by “BPA Free” plastic coffee makers that still use plastic. They use BPS, which is practically the same material with a different name so they can legally say “BPA Free” under the FDA’s regulations. Glass is the only way to get around this and Chemex pour-over drip coffee is the purest form. No more ingesting toxic coffee made in cheap Chinese plastic machines. If the pour-over is too much work for you? Do the plastic free french press! I actually have both because a french press can be stronger and some mornings I want to soak my beans for 10 minutes before sipping on the java. Yes, I recommend both and actually use both. They are both simple. Pour hot water in and walk away. For the ChemEx, I made a video below for you to see how easy it is. 1) Boil Hot Water – This is kind of obvious. You must boil water. I myself use a pure glass kettle I got online, because again I do not want to use a kettle made out of random metals with unknown interior aluminum coatings. 2) Grind Beans – Since we’re buying organic whole beans, you will need to grind them. With the Chemex it is up to you how you want to grind your beans. Most people will say a coarse to fine grind is best but I like to grind my beans very fine so the water takes longer to pass through and my coffee is stronger. For that reason, I bought a multi setting electric bean grinder and it has lasted me years. You can grind the beans while the water is boiling to save time. 3) Set Up Chemex – Place a filter in the top of the Chemex glass beaker, then pour the ground beans inside of the coffee filter. I actually use warm water to wet the filter ahead of time. They say this is better for the coffee oils or something but I say that is a wives tail because it’s going to get wet as soon as you pour water anyways. Why do I do it then? To rinse it off. Warehouse dust who knows. 4) Blooming – Blooming is when you pour just enough hot water on your coffee grind so that it gets wet, but you then let it sit for about 45 seconds while the gasses expel. Coffee experts swear by it, I do it because everyone says to do it. 5) Brewing – After the blooming process, you just slowly pour hot water over your fresh ground coffee beans and watch the sweet liquid flow into the Chemex beaker. This takes a few minutes but once done, you’re ready to drink the purest freshest best ever coffee. 6) Profit – Now that you have taken the 3 to 4 minutes to make that coffee, enjoy the hell out of it. This is your organic fair trade all glass, nontoxic plastic and BPA free premium fresh ground coffee. You won’t ever be able to go back to a plastic coffee maker. All glass everything! Many people swear by the french press, and I can’t blame them. It is maybe the fastest laziest way to make quick coffee. I think the clean up is a little harder and you must be OK with getting coffee grit in your coffee, but other than that, it really is not a bad way to make coffee. It does require the beans be ground more coarse and can sometimes taste weaker because of that fact. So I grind my beans super fine and deal with the grit. I do prefer the simple one swift toss of the coffee cone from the Chemex as far as clean up goes so it is easier and smoother. Chemex is my choice but I own and use both. Leave a comment below with how you make your nontoxic coffee and what beans you buy. There’s something perhaps new– Mr. Coffee now uses BPA free plastic in all its coffee makers. I contacted them today. However, I would still prefer glass if I had the choice. “BPA free plastic”, means BPS or BPF. They just changed one small thing to change the name to avoid warning labels. Do not buy BPA free, just avoid plastic. Awesome! I’ll have it give it a whirl some time.